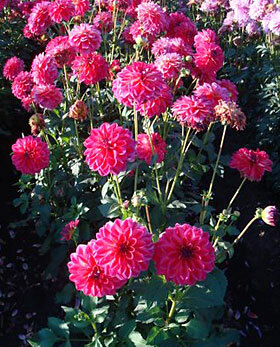 Dahlias as cut flowers are grown either from stored roots or rooted cuttings. Roots should be stored dry at 45 to 50 F, and free of soil. Propagation is prohibited for ‘Karma’ dahlias. These are patented and planting stock (rooted cuttings) must be ordered each year. Schedule cutting shipment so they can be planted with minimum delay. Growers storing their own roots bring them into a warm environment in spring to sprout. Roots should not be planted in the high tunnel until the frost-free date. Seed propagation is common for bedding plant types. Single rows with plants 2 ft. apart is a common spacing in high tunnels but may need to be wider for vigorous varieties. Main shoots should be pinched when plants are 2 ft. tall to encourage formation of branch shoots and more flowers. Pinching will delay flowering by 1 to 2 weeks, and flowers may be smaller. Plant support may not be necessary in the protected environment of the tunnel. 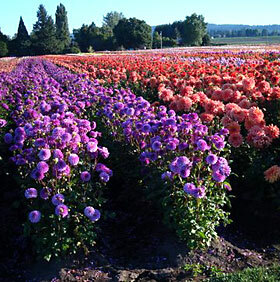 Depending on the variety, plants should begin flowering in 9 to 12 weeks from planting of roots. Plants perform best in cool sunny weather (below 80 F). Ventilate the high tunnel well, and if high temperatures are common, consider shading the tunnel with aluminized shade cloth with no more than 30% light reduction. Dahlias are subject to a number of disease and insect pests that will challenge the grower wishing to produce top quality cut flowers. Among insect pests, Japanese beetles, aphids and leafhoppers are common. We have had powdery mildew infesting the cuttings we had ordered. The Karma series has both decorative and cactus types, and has great popularity as cut flowers. Many varieties sold by commercial dahlia companies are classified as suitable for cut flowers (eg. Swan Island Dahlias). Dahlias should be harvested when the flowers are nearly fully open because they fail to open fully if cut too soon. The flowers wilt readily, so should be harvested into a hydrating solution, or into hot water that is allowed to cool. Flower vase life is relatively short: 3 to 5 days, or 7 to 10 days with a hydrator.